Grease a 13x9-inch baking pan. In a small bowl beat all filling ingredients until mixed; set aside. Place all batter ingredients in blender: cover and blend until smooth, scraping sides often. Pour remaining batter over filling. Bake, uncovered, 50-60 minutes or until puffed and light golden brown. Sift powdered sugar over top. 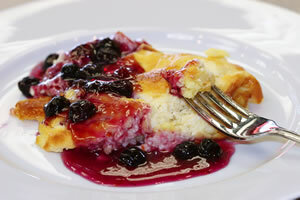 Serve blintz with sour cream and berries or heated pie filling.